We manufacture our grips here and we refuse to take short cuts that will compromise quality. How to inquire or order SGM custom grips? Claims for defects must be made within 30 days after the purchase was made. If you have a claim for a possible defect or return, your claim must be initiated via email, this gives SGM Grips and you, the customer, a written copy of the claim. After sending an email, please call us or provide a phone number so that we can call you to discuss the problem as well as a solution. Claims and related discussions are usually beyond the scope of emai and a conversation is usually needed. Simply call to discuss your situation civally and descriptively, we always do our very best to get you what you want. Exchange policy is done on a case by case basis. If you simply change your mind after we start making custom grips to YOUR specs, the grips can not be undone. Once we start any custom set of grips, they belong to you, no exceptions. Think before you order! Do SGM grips work with Challis Bushings? Yes, SGM grips will work properly when you choose the correct Challis bushings. We ran into complications when a customer failed to use the correct Challis bushings. Be sure to use the correct Challis bushings and you will have no problems. For Ultra Thin 1911 grips, be sure to purchase "Ultra Thin Challis bushings". Ultra Thin grips Must use the correct Ultra Thin Challis bushings. What kind of checkering can I get for my grips? You can look through the sections of the website to see what checkering is offered on each gun. All checkerinyg textures are not available for every type gun due to thickness and depth of cut some restrictions often apply. If you don't see a certain type checkering for a certain hangun it may not be available. Be sure to ask if you do not see a texture pictured. Will the grip screws that came on my Kimber Solo work with SGM grips? Are SGM concealment Grips thicker than the Standard Kimber Grips? SGM Solo Grips are approximately .030" thicker per grip panel at the Apex of the palm swell. We have added the same type palm swell that is built into 1911 grips for an Ergonomic grip on a handfull of fire power. The thin factory grips were lacking for me when I got my first Solo in the same the week that Kimber introduced the Solo at the Shot Show. I got home and went to work making a grip that I can hold firmly. fwiw, I am 64 years old and have a bit of arthritis so the extra thickness has served me well. The added thickness does not hurt concealability at all, the widest point on the Kimber Solo is still the ambi safety so the thickness does not hurt anything. Unlike the injection molded Kimber Solo factory grips which have a minute checkered grip, SGMGrips are all checkered like1911's. We use the identical 1911 spacing and depth simply because it is the most proven checkering on the market. We do not offer stippling, we do however, offer 1911 style checkering, our checkering is 100% done in our Haas 4 axis CNC Milling machine. We do not do hand checkering. There is a 25% Restocking fee for Returned grips. *** We give Free USPS Priority shipping on our grip sales - BUT- after the sale is complete and delivered, for any reason, you change your mind and/or no longer need the grips. When the Sale cost is refunded, the USPS Priority Mail shipping cost that we spent on your sale will be charged back against your refund. Be sure to buy what you really want. The types and varieties of grips we sell are shown clearly on the website. Re-packaging labor and shipping are not free, it adds expense when we ship and reship as well as the cost of re-packaging. *We simply can not reship for free if you buy grips and change your mind. **All returned grips must be shipped in a bubble protected package, and/or the bubble protected package that the grips were originally shipped to you. *Any returned grips that are damaged and/or the packaging is damaged is subject to review in a case by case manner. We guarantee our grips to be free from defects, if you receive SGMGrips and find a problem due to Craftsmanship, just call us at 912-531-8340 and we will replace them at no cost upon return of the grips in question. I make every set of SGMGrips myself, so I can't blame anyone for an oversight but I do gurantee my product and strive for your full cutsomer satisfaction. Call me at 912-531-8340 if you have or if you think you have a problem. Solo screws & O Rings questions?? 1. The factory Solo grip screws only screw into the frame bushing about two threads. The STS model comes with stainless screws, the black and silver Solo does not. A screw that is longer than the factory Solo grip screw will lock your magazine due to being too long. NEVER use the wrong grip screws on a Kimber Solo. Doing so WILL create an unsafe condition. What kind of oil is this on my grips when I received them? 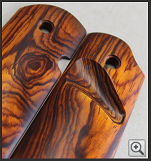 We Tung Oil treat many of our exotic wood grips with Liberon Pure Tung Oil AT NO ADDED COST. The grips may have some residue left on them inside the zip lock bag. To wipe clean use an old T Shirt or old rag to wipe any remaining residue or seepage from the grips, then mount them on your gun and enjoy. * Liberon Pure Tung Oil is not sold in the United States but is available on eBay.